URBAN116 is an innovative system that leads to new possibilities in the trade fair construction sector. Based on standard modules the dynamic system enables both ambitious design and creative freedom. This flexibility can be seen in the o2c-based online planning tool. The URBAN116 online planner allows you to play with the modular system and discover the many options available. Design your trade fair stand just as you want it to be. 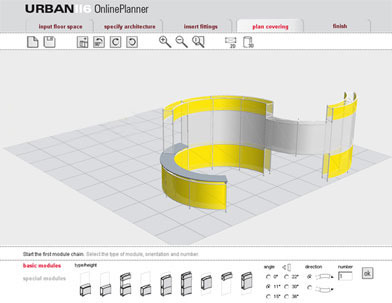 You design the stand architecture using the modules you require, insert the desired fittings, and choose the covering after these steps, the online planner allows you to save and print out your design. When you have finished, you will receive a draft plan number which you can use to access your stand architecture at any time over the next 12 weeks. You can insert your draft plan into your customer presentation as an illustration. In this way we can give you the best possible advice on how to translate your ideas into a reality that displays your products to their best advantage.